• Enjoy discovering Pirates with kid-safe games. • Look no further! 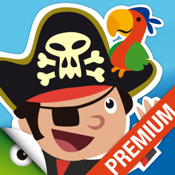 This app is full of puzzles, visual acuity games, memory, flashcards, find the difference, paint, dress-up... and much more for your kids to have fun with our friendly pirates. • Easy to use: Kids will have hours of fun as they explore and learn all about the extraordinary world of pirates. • The app contains 100 games, with different levels of difficulty. • Content for children aged 2 years and above. Games for everyone in the family. Hours of fun. • No ads and no in-app pruchase! • Loads of content to find the best activities, whatever your needs. • No ads & no in-app pruchase!